High exposure to music contents from children songs to master classical repertoires, children learn to engage in music more naturally. Play music! We build our curriculum based on national preschool standards. Moreover, we focus on applied skills in music. Little Mozart program is already built into the preschool program. Children get to sing, dance, tap into a daily routine. Our class size is small to give attention to each individual child. Students try out different instruments, learn the basic method in piano, learn to sing together, draw art with imagination, experiment how numbers work, practice writing, and receive daily music appreciation session of listening to popular songs, live performances and more. 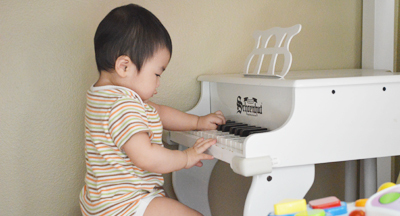 With a firm belief that sense for music is developed as early as being in mother's womb, we encourage infants, toddlers with young moms and caregivers to join our Little Mozart class for toddlers. Ask for more details. Children progress skills week by week in a different level. Whether attending once a week, twice a week or three times a week, we develop a detailed progress report and work together as a teacher, student, and parents in one team. Find out available dates and classes.